but I can't find one I like. So I'm making my own. This design printed on "silver" aa threads. $20 in person / $22 online. Want one? This is the first printing, and I'm not ordering many. 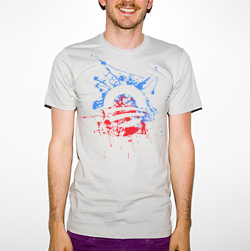 Printed locally, sustainably, and on American Apparel (expensive but incredible) shirts. and I'm not printing more than are ordered. Any discount from printing more will be donated to the campaign.